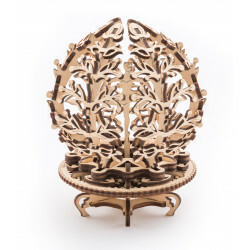 is still in use and can be seen when the Queen travels in it from Buckingham Palace to Westminster to open Parliament. 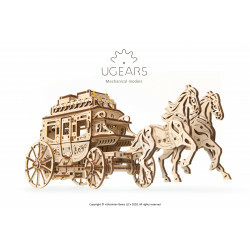 Regardless of one’s take on British Monarchy, anyone who appreciates history and the beauty of mechanics would fall in love with UGEARS Royal Carriage. Inspired by the Royal Wedding of Prince Harry and Meghan Markle and designed after another Royal coach, a 1902 State Landau, the new UGEARS intricate wooden model allows your inner princess to impress the crowds and travel in style. 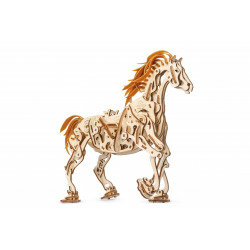 The carriage is drawn by four elegant horses; it is very detailed with a hidden gem of a mechanical motor inside. 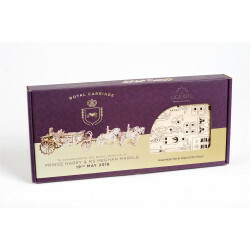 The coachmen are dressed in their finest attires, the seats of the passenger compartment resemble soft leather, and the Royal coat of arms is laser engraved on the door panels. 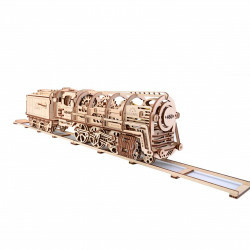 The rubber band suspension belts give the model a realistic feel. 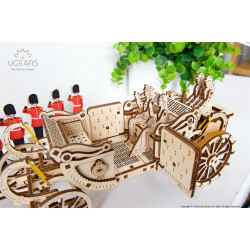 The kit has two sets of figures, The Queen and The Duke of Edinburgh and Prince Harry and Princess Meghan. 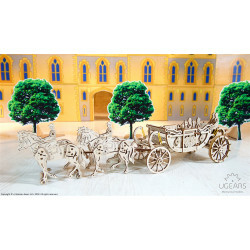 You can take them on a royal stroll – two figures at a time. 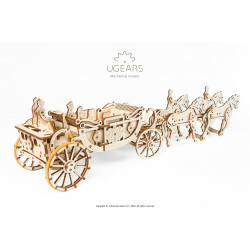 The skeleton design of the carriage allows you to witness the miracle of the laws of motion and kinetics. 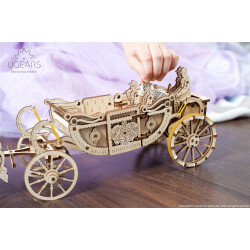 The crown on the back of the carriage has a secret function, and makes it possible to wind up the wooden motor pushing the Royal Carriage forward under its own power. 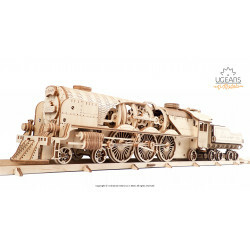 Despite the tiny-sized motor, a fully wound up (25 half-turns of the winding key max) carriage can travel up to 4 meters. 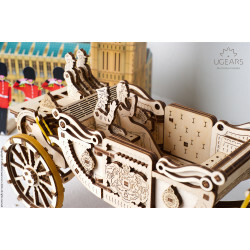 As Daria Dubets, company director of UGears, puts it: “The commitment from the royal couple to sustainability and charity at their wedding is incredibly inspiring. 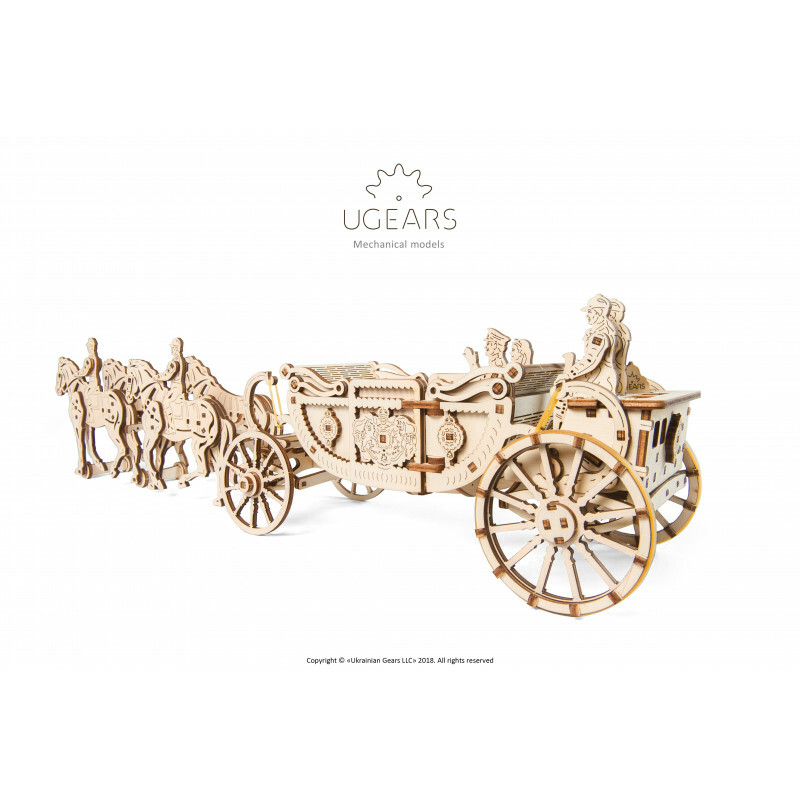 At UGears, we have worked hard to ensure our company uses only sustainably sourced FSC-certified wood and we are pleased to be able to offer a royal wedding memento which reflects the couple’s wishes and goals. 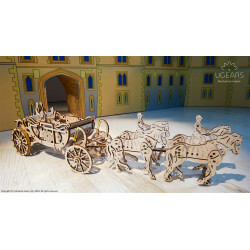 Like all our models, the Royal Carriage is made with high-quality plywood and is assembled without the use of glue or any special tools.